Once the students complete the work on the assignment, they can submit their work online through School Loop. The teacher will be able to view their assignment and grade them based on what was submitted through the portal. Tasks: Current Assignments, located in the left column of your portal homepage. 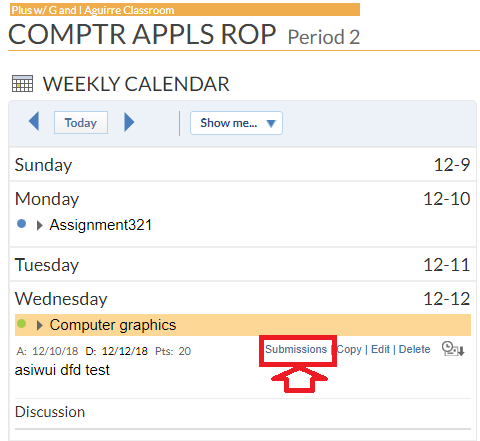 Click anywhere in the row showing the assignment title to reveal the assignment details, then look for the Submit Work links. Weekly Calendar, also located in the left column of your portal homepage. 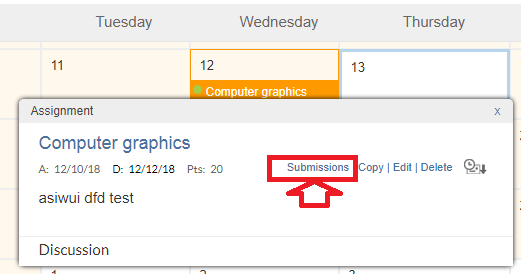 Just like the option above, click the row showing the assignment title to reveal the assignment details and the Submissions links. My Calendar: hover over any assignment title and you will find the Submissions links. Class Sites: use the menu located near the top right of any page in your account to access your class sites by clicking on the Classrooms tab and then look for your assignments under the Curriculum tab. Click on the active assignment with the status color blue to open the details about the assignment. On the right upper corner, you will find the Submit Work option. Choose the files or links to submit. My Locker - submit any file or link you have saved in your School Loop Locker. Check the box next to the work you would like to turn in and then click the Submit button above the locker contents. Device - submit files stored on the hard drive of your computer. Select the Device button alongside the Submit Work option. The below screen is displayed from which you can select the file on your hard drive to be submitted. Click on the Choose file button and select the file. Select the Submit File button in Step 3 to complete the process. If you need help or have questions about submitting your file, you can use the Quick Links (highlighted in the above screenshot) on the right side of the submission page. 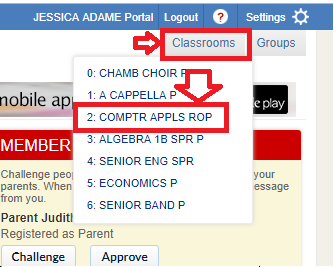 Alternately, you can use the teacher link to send a LoopMail, or you can get help from School Loop staff. Click the Dropbox icon at the top of your portal. Your Dropbox lists a Date/Time Stamp for all the assignments you have turned in and includes a link to download the file in case you misplaced the original. If you submitted a link, then you can visit the link as well.